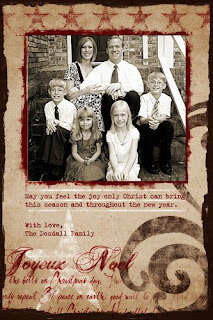 This photo card will go out with our family Christmas newsletter this year. I used the fabulous Sande Krieger's Joyeux Noel Christmas card templates at 2 peas. All I had to do was plop in my photo and voila! So easy, and I love it! This one was originally 5x7, but I tweeked it and resized it to 4x6 to cut back on printing and postage. I had 75 of them printed at Costco, and it cost about $10 bucks. Can't beat that! I also used a free photo action by Pioneer Woman.